Superfood lattes were big last year and they’re even bigger this year. We’re going beyond whipping up some golden milk and entering the realm of charcoal, crystal, and unicorn lattes! I’m adding to the mix with this one I dub the Mermaid Latte. How amazing that there are foods on this beautiful planet of ours that contain all-natural hues such as this gorgeous blue? I’ve always felt a deep love for the ocean. I find myself feeling the most at home whenever I travel and wake up to a sea of blue. There’s something so peaceful and tranquil about being by the water that makes everything else that doesn’t matter just melt away. A big part of this may be due in part to the fact that the ocean is blue. In color therapy, different colors in the rainbow can be used to heal the body emotionally, physically, mentally, and spiritually. Throughout our life, we see colors all the time around us and begin to associate certain ones with certain feelings. Blue is associated with being soothing, calming, and relaxing so it makes sense that we may find being by the ocean so healing. I may not live by the ocean but I’m finding a way to pay homage to that and invite the healing powers of blue with this latest tonic. I believe that food is much more than just providing our body with fuel to energize and get us through the day. It’s a sensory and intuitive experience and it’s so important to nourish our bodies along with our minds and souls. 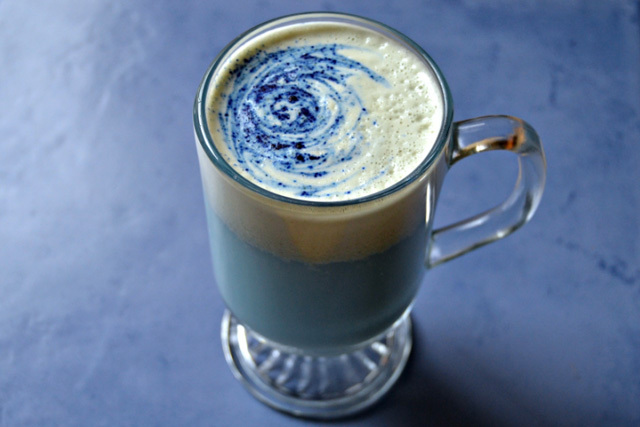 The Mermaid Latte embodies more than just something to drink; it becomes a ritual in making it, methodically taking time in doing so, and then thoroughly enjoying it. It’s creating a feeling of a place in a small way when starting the day. The beautiful blue hue is achieved by using something called butterfly pea tea. This tea gains its vibrant color from a plant ordinarily found in Southeast Asia also known as Asian pigeonwings. The petals are dried naturally in the sunlight in the morning and produce beautiful shades of blue from light to dark the longer it’s steeped. It can be made into tea by brewing the whole petals or made into blue matcha by grinding down the petals into a fine powder. Butterfly pea tea also contains a host of benefits. Being so brightly colored, it contains a dense profile of antioxidants including proanthocyanidins and anthocyanins. Both of these provide anti-inflammatory and antimicrobial benefits, anti-aging benefits, increase collagen and elasticity for healthy skin, and may be beneficial in reducing the risk of cancer and other diseases due to their ability to protect the body against free radical damage. You can try it out yourself and cultivate shades of blue by using the butterfly pea tea, blue matcha, or even spirulina. 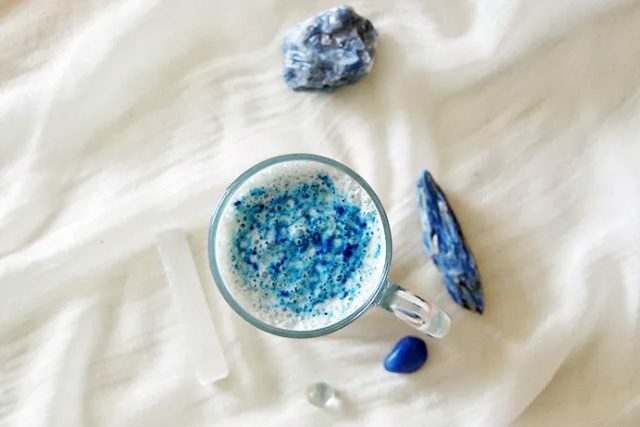 Elevate your morning with a soul-soothing blue latte while nurturing your body at the same time. Brew the butterfly pea tea by steeping 1 teaspoon of the loose tea for 4 to 6 minutes. In the meantime, gently heat your coconut or hemp milk, adding the cacao butter and coconut oil to melt. Add the sea salt, vanilla, (and if using, the sweetener and/or collagen) until everything is warmed through. Once the tea has been steeped to a rich blue, add this along with the warmed milk to a high-speed blender. Blend everything well for a minute or two until light and frothy. Pour into your favorite mug, sprinkle and swirl some extra blue matcha, and enjoy!